But what would your pet think of if they were to make resolutions? Resolution #1:I will eat less and exercise more. Too many nights on the couch, too many dog biscuits and too little time running around the local dog park has made me a little… fluffier. I don’t think the old “I’m-just-big-boned” excuse will work anymore. I resolve to whine and whine until my human takes me to the dog park more! I’ve got begging down to an art – I’ve got my humans wrapped around my tail – but it sure is degrading. I promise to reserve the begging for worthwhile things, like going out to the park and that delicious T-bone steak. Resolution #3: I will recognize the difference between inside and outside. I vow to (try and) resist the urge to snoop around the cat’s private lavatory – even though it’s a lot of fun and really makes her go nuts. 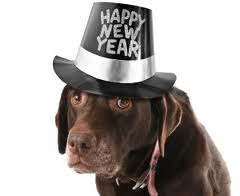 Resolution #5: I won’t snap at the vet anymore. I’ll remember that the vets and their staff are just trying to help in their own, mean, awful way… They really do push my buttons though. Resolution #6: I won’t steal food… as much. I won’t steal food anymore… Okay, I won’t go out of my way to steal food anymore, but if they make it easy for me- I am going for it! Resolution #8: I’ll bark at the mailman less. Even though I am pretty sure he is up to something, I will try to refrain from scaring the pants off of him when he leaves the mail. Resolution #9: I’ll tolerate those awful clothes a little more. Sure.. You think they are cute, I think they are uncomfortable. But I already make you clean up my poop, so I guess we are even. Resolution #1: I promise to trim down a little. Being bigger means there is more of me to love, but perhaps I can stand to lose a little weight… but so can you, so don’t judge! Resolution #2: I’ll be friendlier to strangers. I won’t turn my nose up at newcomers right away. Instead, I’ll give them a chance to scratch my ears before disappearing for hours until they leave! I’ll purr more and be more affectionate to everyone in the family, except that stupid dog – unless he actually keeps his promise about staying out of my cat litter! Resolution #4: I’ll be nicer to the more tasty animals in the household. Resolution #5: I won’t be as picky with my food. Just as long as it’s the right texture, taste and temperature, and given at the right time each day. Resolution #6: I’ll be nicer to the furniture. After all, that’s what the scratching post is for. Besides, I’ve made enough marks to show who really owns this place. To do any more would be showing off. Resolution #7: I’ll stop hiding stuff behind the couch. Resolution #8: I’ll let everyone else sleep later. I suppose 5 a.m. is a little too early to get everyone up to feed me. I resolve to hold on until 5:30 a.m. Resolution #9: I’ll stay off the counters… when company is around. 🙂 Just one of those things to make you smile!